Originally the location of a French encampment, Fort Howard was the first fortification in the region that would become the state of Wisconsin. 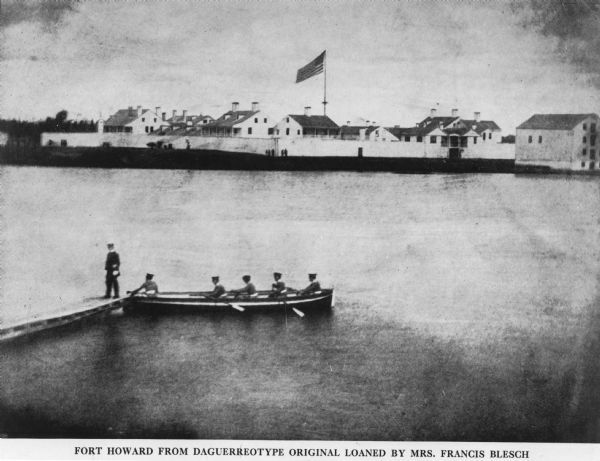 Founded in 1816, near the mouth of the Fox River in Green Bay, Fort Howard was an integral part of the expansion of the United States throughout the newly acquired western territories. The aftermath of the War of 1812 and subsequent westward expansion of the United States at the beginning of the 19th century necessitated the involvement of the military in multiple capacities. Exploration, frontier defense, and securing trade were just a few of their many duties. Forts in the frontier were the primary symbols of an American presence in the largely unpopulated and untouched western territories. Like most frontier fortifications, Fort Howard was a center of trade in Green Bay in addition to being a garrison for local troops. 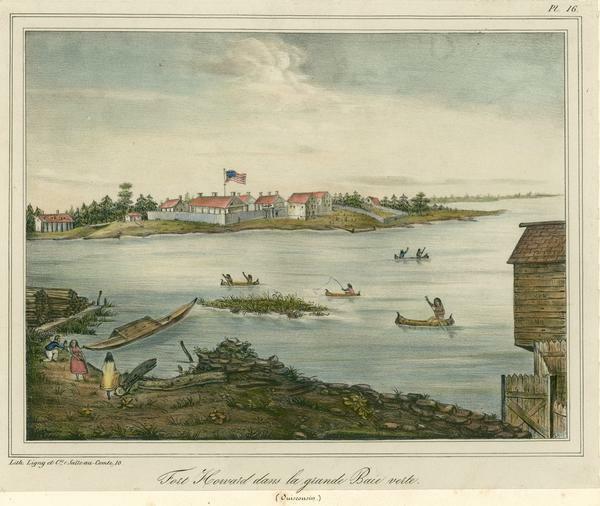 While the location of Fort Howard was crucial to the prosperity of the area, its original purpose was the protection of the fur trade in the region and being a critical link in the chain connecting established eastern forts to the new northwestern territory. August 7, 1816 marked the beginning of American presence in Green Bay, when American soldiers sailed into the mouth of the Fox River. The engineer in charge of selecting the location for the new fort, Major Charles Gratiot, could find no superior location to build upon than the remnants of the old French and British fort that stood in the area. The original French fort had been built in 1684 and rebuilt in 1717 but had not been garrisoned since the British abandoned it in 1763. A detachment of soldiers were sent into the vast woods neighboring the building site to gather logs for the housing and palisade that would surround the fortress. A local businessman, Louis Grignon, was also contracted to furnish a portion of these timbers. Fort Howard was established and christened after the late General Benjamin Howard who had died at St. Louis in 1814. 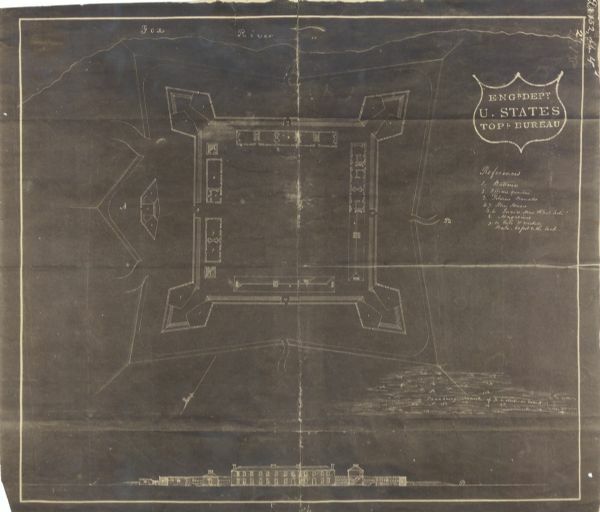 The fort was initially estimated to cost $16,644.70 to build. The style of Fort Howard was common for the time. The outer log stockade had a whitewashed finish to present professionalism and had fortified blockhouses at each corner for artillery emplacements. The fort also contained several other buildings on the premises including a barracks, hospital, officer’s quarters, school, company kitchen, warehouse, and a jail. Many of the buildings have since been lost or destroyed entirely but of some are being preserved at Heritage Hill State Historical Park, including the original hospital (built 1834) and kitchen (built 1835). Heritage Hill has also built replicas of the officer’s quarters and school. The location of Fort Howard was crucial to its importance. Situated on the banks of the Fox River, which flows from Lake Winnebago to Green Bay, Fort Howard had excellent transportation routes westward inland via the river and eastward on Green Bay into Lake Michigan and the entire Great Lakes system which had access to the older forts, Mackinac and Dearborn, in the east. The transportation routes were further improved with the construction of what is known as the old military road beginning at Fort Howard and extending to other frontier forts, Crawford and Winnebago to the west. This road facilitated the transportation of information, supplies, munitions, and troops throughout the region. The availability of this transportation route would have proved invaluable if other routes were severed during wartime, although it was never needed in that capacity. Fort Howard may have been a relatively small fort and in operation for under 40 years (1816-1853), but it played host to multiple major figures in history. The second man to serve as commandant of the fort, and the most distinguished officer to serve at Fort Howard, was Major Zachary Taylor who arrived in the spring of 1817. Major Taylor would rise to national fame as a General in the Mexican-American War and later become the 12th President of the United States. Another national figure was also present at Fort Howard: Jefferson Davis. The later President of the Confederacy was never stationed at Fort Howard but he was known to visit the encampment on occasion for recreation and hunting. Other national figures to spend time at Fort Howard include General Winfield Scott, Mexican American War hero and creator of the Anaconda Plan in the Civil War, and Captain Martin Scott who fought in the War of 1812 spent time at many of the forts in the Northwest territories and was killed in action in the Mexican American War. 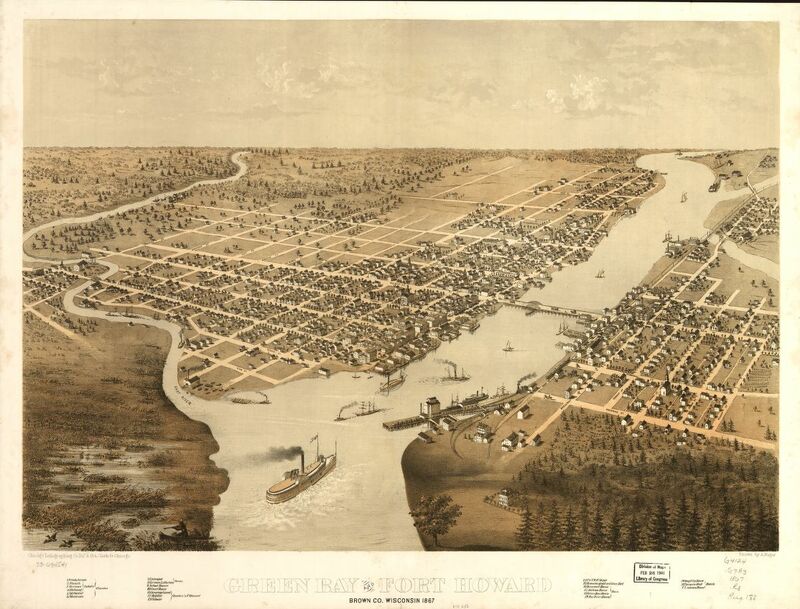 The growth of the settlement in Green Bay was influenced by the presence and operations of Fort Howard. Officers of the fort helped pacify local Native American tribes as well as earlier French and British settlers. This was key in transforming the image of the army from being occupiers and enforcers to neighbors, friends, and protectors. The lavish military balls and formal dances invited settlers to engage with the soldiers in a social setting and led to the fort being known and loved for being the social center of the settlement. The army band and parades were a favorite of the children in Green Bay who were also allowed to attend school at the fort. The school provided the only formal education center in the region and was a major benefit to the settlers. The hospital at Fort Howard was also of great importance to the region as it was the only place to receive trained medical attention within a day’s travel for many people. These factors led Fort Howard to becoming a vital pillar of the community. The fort’s major military task was defense against Native American uprisings. The fort played a role in a few battles between American settlers and the region’s native inhabitants in such engagements as the Black Hawk War in 1832, when non-military residents of Fort Winnebago were sent to Fort Howard for increased safety. The relationship between the local Native Americans and the fort’s residents was not always confrontational. Fort Howard held many Indian councils helping to unite the locals during its occupation and the resident Indian agent was an extremely well respected member of the community. The fort underwent many command changes through its occupation and even was relocated to higher ground at the nearby Camp Smith overlooking its location from the other side of the Fox River from 1820 to 1822. The first commander of Fort Howard was Colonel Talbot Chambers who arrived at the establishment of the fort in 1816. His garrison consisted of two companies of Chambers’ Rifle Regiment, two companies of the Third Infantry, and an artillery detachment. Besides founding the fort, Colonel Chambers is remembered to have participated in the successful reconciliation of the French settlers toward the new American presence. Major Zachary Taylor arrived as the new commander of Fort Howard in the spring of 1817. Taylor relocated his family to the fort with him. The command of Taylor was a shining moment for the fort as it was known for fine hospitality and served as the center of social life for the entirety of the surrounding settlement in the area. Major Taylor continued Chambers work toward integrating the French settlers in the area and during his command numerous French settlers completed the process to become fully naturalized citizens of the United States of America. Taylor’s command at Fort Howard only lasted for three years, yet many residents of Green Bay recalled with pride the period that the future president spent living amongst them. After Taylor, Colonel Joseph Lee Smith was shortly in charge and desired to build a fort of stone at Camp Smith across the Fox River and moved the garrison there for a year but was superseded by Colonel Pinkney in 1821 who immediately moved the troops back to Fort Howard. During Pinkney’s command Fort Howard again served as the center of social and military life and was thoroughly restored as it had fallen into slight disrepair in the previous years. Colonel Pinkney’s entrance was noteworthy as he and his troops arrived on the first steamboat to navigate the upper Great Lakes, the aptly named Walk-in-the-Water, though it did later shipwreck during the fall of 1821 on Lake Erie. Pinkney was loved by settlers and soldiers alike for his personality, but his lack of discipline when it came to his soldiers stood in stark contrast to the next commander, Lieutenant-Colonel McNeil, who took over when Pinkney retired in 1823. McNeil, who only served until the spring of 1824, got Fort Howard and it troops into excellent condition in the short time before Major Daniel Baker arrived. In 1826, a wave of guard changes that swept Fort Howard began with the sending of the Third Regiment westward to the Mississippi River region. In the next few years, the garrison at Fort Howard consisted of companies of second regiment, first regiment, and Fifth Infantry. From 1828 to 1841, Fort Howard was occupied by members of the Fifth Regiment. At the outbreak of the Seminole War in 1841 the garrison was withdrawn and would only be occupied once more when Colonel Francis Lee brought troops to Fort Howard for a few months. The final departure of troops from the fort on May 22, 1852 marked the end of the usefulness of Fort Howard before the government authorized the dismantlement and sale of the property in 1863. Over the following years, most of the remnants of Fort Howard were lost due to the expansion of the city of Green Bay, with the exception of the few structures preserved at Heritage Hill State Historical Park. The foundation of the Fort Howard warehouse could be still be seen as recently as 1916 when the railroad yard increased in size. The foundation is expected to exist underground as it was not destroyed during the expansion but rather buried and built over. There has been a renewed interest in finding the original site of Fort Howard by local historians as discovering the warehouse foundation could lead to the exact location for the rest of Fort Howard. Bristol, Mary Ann Brevoort. (1879). “Reminiscences of the Northwest,” Wisconsin Historical Collections, vol. 8: 293-308. Schooleraft, H. R. (1821) Narrative Journal of Travels through the Northwestern Region of the United States, 368-370. Fonda, John. (1868). “Early Reminiscences of Wisconsin,” Wisconsin Historical Collections vol. 5: 205-284. Kellogg, Louise Phelps (1934). “Old Fort Howard,” The Wisconsin Magazine of History 18.2: 125-140. Evans, William L. (1900). “The Military History of Green Bay,” The State Historical Society of Wisconsin. Durbin, Richard; Durbin, Elizabeth (1984). “Wisconsin’s Old Military Road: Its Genesis and Construction,” The Wisconsin Magazine of History 68.1: 2-42. Jones,George; McVean,Norman (1924).”History of Lincoln, Oneida, and Vilas Counties Wisconsin.” Minneapolis. Jones, Meg (2010). “History buffs launch search for Fort Howard’s footprint,” Milwaukee Journal Sentinel.